TO SUIT: A6 C6 (SALOON & ESTATE) FACELIFT MODELS FROM 2009-2011. GENUINE AUDI PARTS. DRIVERS AIRBAG (BLACK 3-SPOKE MULTIFUNCTION STEERING WHEEL): 4F0880201BP. PASSENGER AIRBAG: 4F2880204F. THE SET INCLUDES. Audi A4 B8 Drivers Airbag. REMOVED FROM 2014 AUDI A3 SALOON 8V 4 DR. DASHBOARD INCL PASSENGER AIRBAG. FRONT BOTH SEAT BELTS. COMPLETE AIRBAG-DASHBOARD KIT. PARTS MAY REQUIRE WIPING DOWN FROM ANY STORAGE MARKS OR DUST GATHERED WHILST IN STORAGE. THIS AIRBAG KIT IS FROMCOPE MODEL 2 DOOR. IN GOOD WORKING ORDER.COMES AS DRIVER AIRBAG PASSENGER AIR BAG DASHBOR 2 X FRONT SEATBELTS ANY QUESTIONS PLEASE RING 01142442222' POSTAGE CAN BE ARRANGED AT BUYERS COST. Audi A6 S6 A7 RS7 BAG RH Drivers Side. Part Number - 4G0 880 201 P. Colour - Black. Isle of Wight. Airbag Drivers Side. Engine Capacity. Colour - Black. Part Number - 4G0 880 201 P. Engines will be sold as photographed (if removed from vehicle). Donor Car: 2007 Audi A5 Coupe 3000cc Quattro. The New and Used Audi Parts Specialist for all Audi models worldwide. Audi Part Number: 8K0 959 655. It may fit others. TO FIT: AUDI A3 8P (3-DOOR HATCHBACK) FACELIFT MODELS FROM 2009 - 2012. ONLY SUITABLE FOR 3-DOOR FACELIFT MODELS FROM 2009 - 2012 . GENUINE AUDI PART. PART NUMBER: 8P3 880 741 C.
Audi A3 8P 2009-13 airbag kit. 2 x Front Seatbelts 3 or 5 door. Dashboard - Original Audi. Passenger airbag - facelift plastic Type. Driver airbag - 4 spoke only available. I don't brake cars! NO PANELS, NOTHING . DRIVERS AIRBAG (3 SPOKE TYPE). - BLACK DASHBOARD. GENUINE AUDI PART. IN USED CONDITION AND FULL WORKING ORDER. DASH & DRIVERS AIRBAG MAY HAVE WEAR / MARKS FROM GENERAL USE (SEE PICS). - AIRBAG ECU. Audi Steering Wheel's Airbag. Airbag Condition. Airbag Color. Airbag Part Number. Airbag Texture. Airbag Stitching. Send us a picture of your current steering wheel so we can see it clearly, we will check compatibility. Donor Car: 2013 Audi A4 B8 FL Saloon 2000cc. The New and Used Audi Parts Specialist for all Audi models worldwide. Audi Part Number: 8K0 959 655 N. It may fit others. Dashboard Airbag. Steering Wheel Airbag. Airbag Module. All our parts have been checked and are in good working order. At BlackStone Breakers we pride ourselves on our friendly and helpful nature; we are not a scrap yard. AUDI A3 8V 2013 - ONWARDS. REMOVED FROM AUDI A3 8V 2013 S LINE 5DR 1.6 DIESEL CLH 6 SPEED MANUAL GEARBOX IN WHITE. PASSENGER AIRBAG. WE AIM TO RESOLVE ANY ISSUES WITHIN 24 HOURS. PART NUMBER 8V0 880 204 D.
IT IS THE DRIVERS STEERING WHEEL AIR BAG, THE COLOUR IS BLACK. RRP £899.54 FROM AUDI. Body Style: Saloon. 2015 AUDI A3 Airbag Kit. This item has been removed from a: 2015 AUDI A3. Fuel type: Petrol. Year: 2015. Airbag Kit. Includes: Drivers OS Airbag, Passengers NS Airbag and Bare Dashboard Assembly. Fits models: (Q7) 2011 - 2015. - Dashboard - Black. - Passenger Airbag Reconditioning Service . - Driver Airbag Reconditioning Service . However, when buying from AIRBAG TEAM our price includes reconditioning your original Airbag ECU/Module. Was taken from audi S3 2013 flat bottom Steering wheel, Will fit many audi models. I had this on Audi a5 2008 aswell. NOT HAPPY?. - let us know so we can fix it. Part numbers are provided to help identify the part and its compability. We will be happy to help. would like you to know that we will do all we can to rectify any problems. AUDI TT S LINE NEW MODEL GENUINE STEERING AIRBAG 2017 - ON. VERY GOOD CONDITION READY TO FIT. 2017 AUDI Q5 Airbag Kit Parts Driver Passenger Dash seat belts roof kit. PART NUMBER - 8P0880201BA. AUDI A3 S LINE 8P 2005. REMOVED FROM A AUDI A3 8P 2.0 PETROL (2006). DRIVERS STEERING WHEEL AIR BAG. AB, BT, HS,JE,KA, KW, PA, IM, IV, ZE. REMOVED FROM 2006 MODEL. soton car parts. we test all car parts before removing them for sale. to help you with order. Fits models: 2015 - Onwards. - Dashboard (Black). - Passenger Airbag Reconditioning Service . - Driver Airbag. However, when buying from AIRBAG TEAM our price includes reconditioning your original Airbag ECU/Module. REMOVED FROM A 2008 08 REG AUDI A3 8P 1.9 TDI DIESEL BLS ENGINE CODE 5 SPEED MANUAL, 5 DOOR. Make:Volkswagen Audi. Part:pressure sensor. Condition:New genuine part. Part Number:4h0955557. Model:A1 Polo and other various VAG models. We will do our best to resolve any problems you may have. All our parts are security marked before being dispatched. AUDI Q5 SQ5. DASHBOARD AND AIRBAG. COMPLETE AIRBAG KIT WITH. STEERING AIRBAG. AIRBAG MODULE. 2 ROOF AIRBAGS. Version Trim. Collection from our East London Site. Audi R8 Airbag Kit 2007 - 2015 Driver Passenger Dashboard Seatbelts. Fits models: 2007 - 2015. - Dashboard - Black Quattro Reconditioning Service . - Passenger Airbag Reconditioning Service . - Driver Airbag Reconditioning Service . COMPLETE AIRBAG KIT. Collection from our East London Site. This item is in good condition. We do not cover labour costs in any case. Engine Size. IF YOU REQUIRE ANY INFORMATION. 2 x Front Seatbelts 3 or 5 door. Audi A3 8V 2013-on airbag kit. Dashboard - Original Audi - Grey Bottom. Passenger airbag. Driver airbag - 3 or 4 spoke available. Drivers Knee Airbag. NO PANELS, NOTHING . REMOVED FROM AUDI A3 2006 5DOOR 2.0 TDI 6 SPEED MANUAL. BLACK 94718 MILES LX7Z. Audi A5 2017 - Onwards Airbag Kit Dashboard Driver Passenger Belts Repair. Fits models: 2017 - Onwards. - 2 x Front Seatbelts Reconditioning Service . - Dashboard - Reconditioning service . - Passenger airbag Reconditioning service . Fits models: 2013 - Onwards. - Dashboard (Black). - Passenger airbag. - Driver airbag. However, when buying from AIRBAG TEAM our price includes reconditioning your original Airbag ECU/Module. Did you know we our warehouse is in Leicestershire, you can collect or we may be able to drop off?. Make / Model:AUDI A3. A3 2005 -2013 8P 4 Spoke Right Airbag for Hatchback Black. A3 1996 -2004 8L 3 Spoke Right Airbag Hatchback Black. A4 2000 -2004 3 SPOKE DRIVERS AIRBAG (00-04) 4 DOORS ESTATE BLACK. Taken From The Model:Audi A3 2.0 Petrol 5 Door Hatchback 2005. Body style5 DOOR HATCHBACK. Steering positionRHD. An item has been previously used. Apex Car Breakers Ltd. Number of doors3. Version date to2008-04-01. Fits models: 2014 - Onwards. 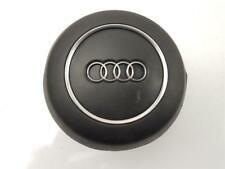 - Audi TT Quattro Dashboard With Speaker (Black). Mon-Thurs: 8:00am - 5:30pm. However, when buying from AIRBAG TEAM our price includes reconditioning your original Airbag ECU/Module. Audi Q5 2013 - Onwards Airbag Kit Dashboard Driver Passenger Seatbelts. Fits models: 2013 - Onwards. Dashboard - right hand drive - colour : Black. Passenger airbag. Driver airbag (option 1, 2 or 3). However, when buying from AIRBAG TEAM our price includes reconditioning your original Airbag ECU/Module. Genuine AUDI A5 8T 08-2016 AIRBAG KIT COMPLETE WITH 2 front SEAT BELTS, driver and passenger AIRBAGS. without airbag module. So after you press buy button you take full responsibility what you are happy with the part condition. KIT CONTAINS : DRIVERS 4 SPOKE STEERING WHEEL AIRBAG. Our site is spread over 5 acres consisting of a reception area, two large storage buildings, de-pollutions bay, vehicle racking facility, in house crushing/bailing zone. 2009 MK2 Audi A3 BAG DASHBOARD DRIVERS PASSENGERS BAGS ECU. Part Numbers :- Drivers Bag - 8P7 880 201 F. Airbag Module - 8P0 959 655 P. Rotary Coupling - 1K0 959 653 D. Dash - 780 10A 010. This comes complete as imaged. Please make sure part is correct before purchasing. We try to describe our parts as honestly as we can, however please also see our images in case we have missed anything. Any questions please ask. International buyers please contact us for price and availability of postage to your location. Removed from below vehicle -.